Archaeologists have disproved the fifty-year-old theory underpinning our understanding of how the famous stone statues were moved around Easter Island. Fieldwork led by researchers at University College London and The University of Manchester, has shown the remote Pacific island’s ancient road system was primarily ceremonial and not solely built for transportation of the figures. A complex network of roads up to 800-years-old crisscross the Island between the hat and statue quarries and the coastal areas. Laying alongside the roads are dozens of the statues- or moai. The find will create controversy among the many archaeologists who have dedicated years to finding out exactly how the moai were moved, ever since Norwegian adventurer Thor Heyerdahl first published his theory in 1958. Heyerdahl and subsequent researchers believed that statues he found lying on their backs and faces near the roads were abandoned during transportation by the ancient Polynesians. But his theory has been completely rejected by the team led by Manchester’s Dr Colin Richards and UCL’s Dr Sue Hamilton. Instead, their discovery of stone platforms associated with each fallen moai - using specialist ‘geophysical survey’ equipment – finally confirms a little known 1914 theory of British archaeologist Katherine Routledge that the routes were primarily ceremonial avenues. The statues, say the Manchester and UCL team just back from the island, merely toppled from the platforms with the passage of time. “The truth of the matter is, we will never know how the statues were moved,” said Dr Richards. “Ever since Heyerdahl, archeologists have come up with all manner of theories – based on an underlying assumption that the roads were used for transportation of the moai, from the quarry at the volcanic cone Rano Raraku. ”What we do now know is that the roads had a ceremonial function to underline their religious and cultural importance. “They lead – from different parts of the island – to the Rano Raraku volcano where the Moai were quarried. “Volcano cones were considered as points of entry to the underworld and mythical origin land Hawaiki. 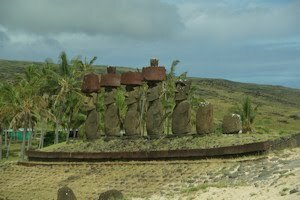 And as the roads approach Rano Raraku, the statues become more frequent – which the team say, indicated an increasing grades of holiness. “All the evidence strongly shows that these roads were ceremonial - which backs the work of Katherine Routledge from almost 100 years ago, “ said Dr Sue Hamilton. “It all makes sense: the moai face the people walking towards the volcano. She added: “What is shocking is that Heyerdahl actually found some evidence to suggest there were indeed platforms.